National Hardware N336-646 V1996 Kickplates in Oil Rubbed Bronze, 8" x 34"
Schlage 548804 682038 Aged Bronze Kickplate, 8" x 34"
Brand: Tell Manufacturing, Inc. | Manufacturer: Tell Manufacturing, Inc.
8" x 34", oil rubbed bronze, kick plate, adds decorative accent & protects the finish on metal or wood interior or exterior doors, easy to install, plastic cover protects finish during installation. Don-Jo commercial kick plate. Made of 3/64-inches thick metal. Beveled 3 or 4 sides optional. Commercial grade thickness. Furnished with grain or satin finish running horizontally to door. Oil rubbed bronze finish. Measures 34-inches width by 6-inches height. Limited 1-year warranty. The Schlage Aged Bronze Kickplate is an ideal decorative accent for a front entryway. Create and inviting space with our Aged Bronze finish that is inspired by traditional design, featuring warm, copper tones that break through its darker, aged exterior. Brand: Tell | Manufacturer: Tell Manufacturing, Inc. Brand: Baldwin | Manufacturer: Baldwin Hardware Corp.
Don-Jo commercial kick plate. Made of 3/64-inches thick metal. Beveled 3 or 4 sides optional. Commercial grade thickness. Furnished with grain or satin finish running horizontally to door. Brass tone finish. Measures 34-inches width by 6-inches height. Limited 1-year warranty. 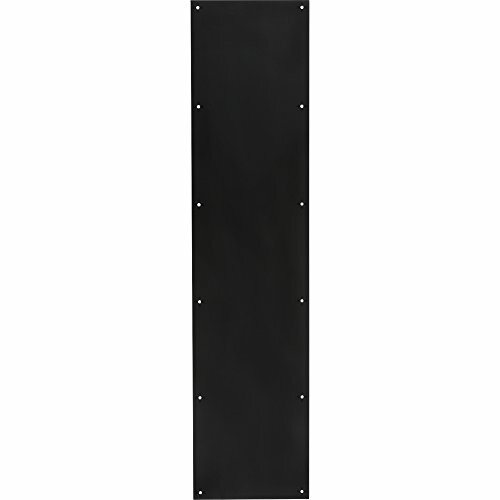 SC8400PA28 8X34 Finish: Solid Aluminum, Size: 8" x 34" Features: -Recommended for all doors subject to normal use, especially doors using a closer. -Door protection plates are fabricated from the finest architectural materials. 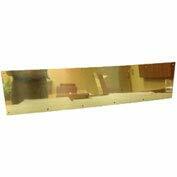 -Protect the bottom of the push side of doors subject to scuffing from foot traffic. -Meet ANSI A156. 6 requirements. Door Type: -Interior. Finish: -Solid Brass. Style: -Contemporary. Product Type: -Kick plate. -Plate thikness: 0. 050". Dimensions: Size 6" x 30" - Overall Height - Top to Bottom: -6". Size 6" x 30" - Overall Width - Side to Side: -30". Size 8" x 34" - Overall Height - Top to Bottom: -8". Size 8" x 34" - Overall Width - Side to Side: -34". CRL Wrap Around Door Shoe with Vinyl Weatherseal is designed for doors that have been undercut too much, or where you must reduce the height of the threshold. This shoe is 2-15/16 inch (74.6 millimeter) high for adjustment, and the door does not have to be removed for installation. Vinyl fingers on the bottom insert compress against the threshold to ensure a water and airtight seal. Screws are included for easy installation. 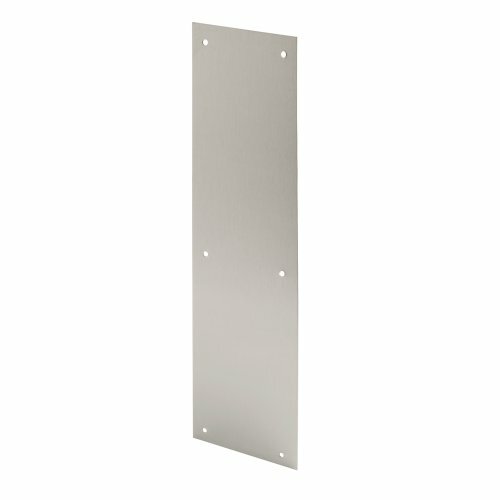 This kick plate is constructed from aluminum and comes in a bright brass finish. The 34 in. length gives full door coverage on 36 in. wide doors. It comes with pre-punched mounting holes and fasteners for a quick and easy installation. Don-Jo commercial kick plate. Made of 3/64-inches thick metal. Beveled 3 or 4 sides optional. Commercial grade thickness. Furnished with grain or satin finish running horizontally to door. Oil rubbed bronze finish. Measures 32-inches width by 8-inches height. Limited 1-year warranty. 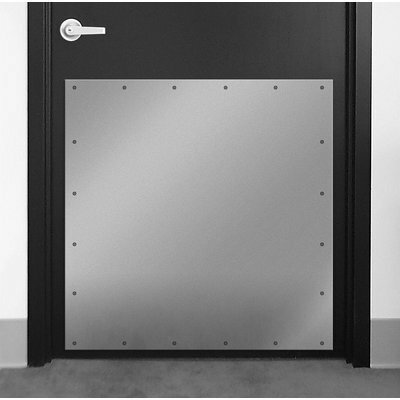 The Rockwood K1050 series rectangular stainless steel kick plate with satin finish covers the lower portion of a door to protect it against damage such as dents, scrapes, and scuffs. This kick plate can be used on either the push or the pull side of a door. 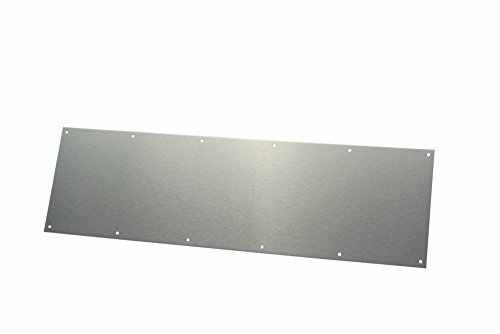 It measures 34 x 3/64 inches (W x T) and is recommended for use with 36"-wide doors when used on the push side and with 35-1/2"-wide doors when used on the pull side. (W is width, the horizontal distance from left to right; T is thickness, the distance from front to back.) The plate is made from durable stainless steel, which is corrosion resistant in most mild environments. The satin finish provides low luster and reflectivity to match existing hardware. 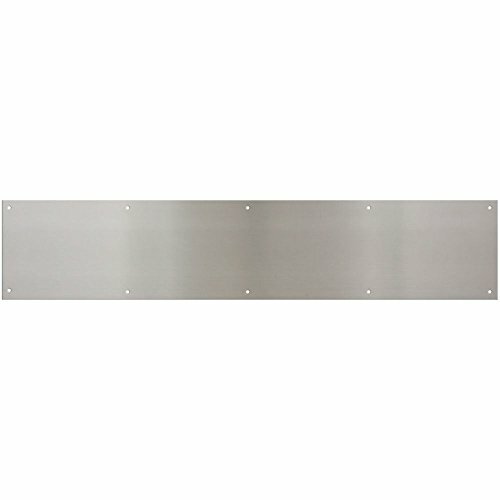 The plate has 10 mounting holes and installs using the included #6 x 5/8" stainless steel screws. Kick plates help protect the lower portion of a door from damage. Also called door, mop, and armor plates, they are manufactured in a range of materials, finishes, and sizes. 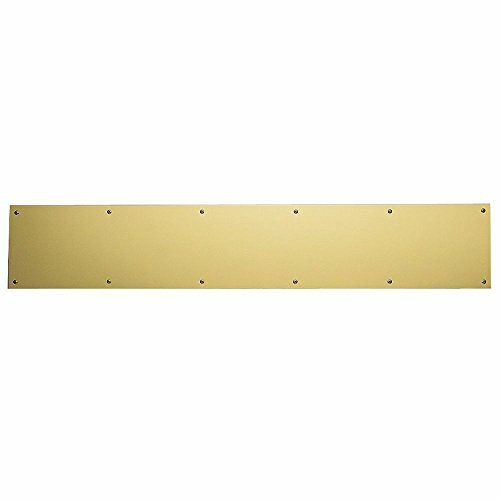 Baldwin, 2000.0630, Kick Plate, Kick Plate, Door Plate, 6 x 30, Kick Plate Collection Solid Brass Kick Plate - 6 Inch x 30 Inch Protect the bottom of your doors from scuffing, scratching, and other abrasions with Baldwin's high quality line of kick plates. Each plate is constructed from 1/2 thick solid brass and coated with a highly durable enamel to protect your choice of three quality Baldwin finishes. For easy installation and measuring, all pre-drilled holes are placed 6 on centers and each plate is shipped with matching Phillips head sheet metal screws. Protect those high traffic doors from the wear and tear of daily use while simultaneously adding just a touch of style by installing a Baldwin kick plate. Your doors will thank you. 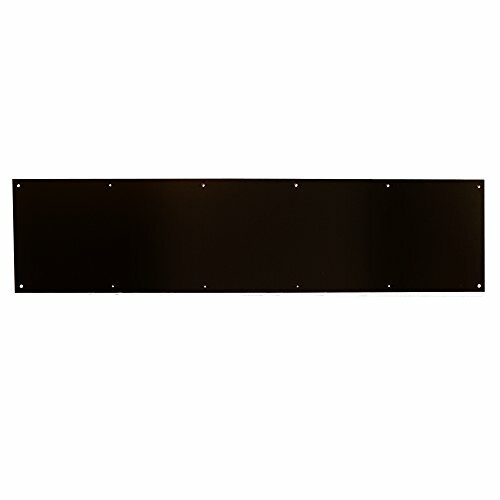 Features: Dimensions: 6 x 30 (152mm x 762mm) Coated with a Highly Durable Baked-On Enamel to Protect Finish Holes Spaced on 6 (152mm) Centers Material: 0.5 Thick Brass Includes Fasteners and Phillips Head Sheet Metal Screws There are brand names, and then there is Baldwin. Constantly building and re-building upon a time tested legacy of superior design, craftsmanship, functionality and innovation, Baldwin Hardware has delivered modern luxury to discriminating homeowners, architects and designers since 1946. From being the first to forge solid brass door hardware to setting precedence for Lifetime Finishes, Baldwin has been and always will be synonymous with revolutionary technology and unsurpassed quality. Aspire to make your home much more than mere shelter, and relax in the assurance that function and elegance can finally flourish within the same line of fine productsBaldwin can show you how. 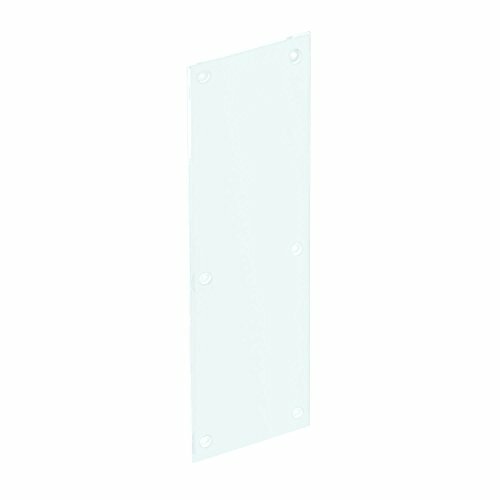 Prime-Line Products J 4923 Push Plate with Acrylic and Clear/Transparent, Smooth Finish, 3/16" x 4" x 16"
This push plate is constructed from acrylic and comes in a smooth, transparent finish. It features 1/8 in. Beveled and polished edges with removable protective coatings (from both sides). these push plates are used to protect the finished surfaces of doors from wear and accumulation dirt and grime on commercial and residential swinging doors. These plates come pre-drilled and counter sunk for quick and easy installation. *Installation note: avoid over tightening. A09-P0628-DBMAG Mounting Type: Magnetic, Finish: Dark Bronze Aluminum Features: -Base material: Stainless steel. -Made in USA. -Can be used on exterior and interior doors. -Traditional style. Door Type: -Exterior/Interior. Style: -Traditional. Country of Manufacture: -United States. Product Type: -Kick plate. Dimensions: Overall Height - Top to Bottom: -6". Overall Width - Side to Side: -28". Overall Depth - Front to Back: -0.05". Overall Product Weight: -6.1 lbs.